NATO in Asia-Pacific: Temporary Deterrence or Forward Thinking? No Comments on NATO in Asia-Pacific: Temporary Deterrence or Forward Thinking? Urgent Briefing – The Secretary General of the North Atlantic Treaty Organization (NATO) has conducted a diplomatic tour to visit the two regional allies in Asia-Pacific, namely Japan and the Republic of Korea (ROK, ‘South Korea’). This raised a legitimate debate regarding NATO’s prospects in a region so far away from the Euro-Atlantic realm. Jens Stoltenberg arrived on October 30, 2017 in Tokyo for a three-day visit. Appointed in 2015 as Secretary General, this was his first tour in Asia-Pacific, throughout which he reinforced the Alliance’s partnership with Japan and South Korea. Having talked with the Japanese Defense Minister, the two agreed on the potential to expand cooperation in the areas of maritime security and cyber defense, additionally to the substantial efforts already undergone. On November 1st, he traveled to South Korea for a two-day trip to meet with the Foreign Minister, and to address the North Korean threat. He made bold comments about this issue, condemning Pyongyang’s nuclear and ballistic programs; Stoltenberg referred to them as a threat to ‘international and regional security’, calling on Kim Jong-Un to abandon this pursuit. Sine the conclusion of the Cold War, the Alliance created a wide range of partnership options through which it pursued fostering good relations with states across the globe. The largest such framework is Euro-Atlantic Partnership Council (EAPC), a 50-nation multilateral forum that encompass diverse actors, from Russia, the Kyrgyz Republic, and Ukraine, to Austria or Armenia. The Mediterranean Dialogue is eligible for states situated in Northern Africa or the Levant, as the Istanbul Cooperation Initiative (ICI) welcomes several Gulf states as Bahrain, Kuwait, Qatar, and the United Arab Emirates (UAE). Additional to these frameworks, there are individual options that are loosely referred to as ‘Partners across the Globe’, and provides interested peers with tailored diplomatic protocols that facilitates a closer engagement to NATO. 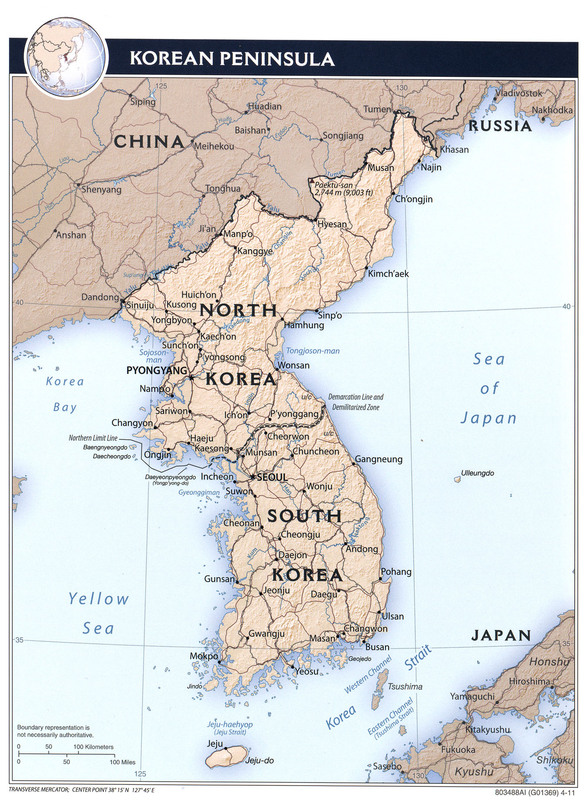 Japan and the Republic of Korea (ROK) are one of those states. And following Washington’s model, they are NATO’s key partners in shaping an Asia-Pacific policy. Evidently, the United States has a leading role in applying and conceptualizing such a policy, but the other 28 states also have a decisive input. It is widely known that NATO has a history of conducting operations and crafting strategies in rapport with issues and regions outside the Euro-Atlantic space in the post-Cold War era. Operation Ocean Shield (Indian Ocean, Bab-el-Mandeb strait), ISAF (Afghanistan) or Iraq Training Mission have cemented the Alliance’s outlook towards the external space amid the 21st century security environment and emerging threats. The 2010 Lisbon Summit formally marked this transition by adding Crisis Management and Cooperative Security to NATO’s core values, in addition to the original task of Collective Defense. The 2010 New Strategic Concept is relevant in application to all issues and challenges, while keeping the focus on cooperative efforts with regional peers. There has been no official military presence in the waters of Asia-Pacific before, nor substantial diplomatic effort in the region under a NATO framework. This marks Stoltenberg’s tour as a milestone in the Alliance’s ‘coming-of-age’ towards the region. The visits to Japan and South Korea can be regarded as a natural sign of solidarity towards NATO’s biggest financial contributor and strongest member, the United States. And that extensively, the effort was an additional deterrence tool in applying pressure towards the North Koreans. Asked whether an North Korean attack on the island of Guam, a US territory, would trigger Article 5, he refused to respond. However, he did mention that NATO’s European Defense system is ready to counter any possible ballistic missile launched from the Korean peninsula. NATO is right to have concerns regarding the North Korean problem. The passive and impotent efforts throughout the past three decades have allowed the totalitarian regime from Pyongyang to develop nuclear weapons, and now, even sophisticated means of transporting them towards enemy targets. The strike range of those ballistic missile do not only extend towards California, Alaska or some Pacific islands, but also over Europe. NATO’s concerns are legitimate and worthy of being shared at the strategic level by all 29 members. While the diplomatic tour in Japan and South Korea can well be accounted as a pressure force towards North Korea, and as a solidarity gesture towards the United States, there is the potential for more than just an episodic touch. Given the rise of China in the international stage and the risks it poses for global trade and regional stability, notably given the standoff in the South China Sea, it’s fair to assume that NATO is considering widening its projection. Benefiting from predictable and strategic partnerships with capable actors in the region, namely Australia, New Zeeland, Japan and South Korea, and its utmost important member in the driving seat, the United States, NATO holds the incentives for a long-term game in respect with the Asia-Pacific theater. Situation Report – Tensions between North Korea and the United States have reached a new boiling point in the past days. Uncertainty and hostilities have been spiked by the newest statements and by an analysis composed by the Defense Intelligence Agency (DIA), the Pentagon’s intelligence service that indicate that Pyongyang is now capable to fully miniaturize the nuclear weapon in order to be mounted as a missile’s warhead. A similar conclusion has been reached by the Japanese as well. Furthermore, U.S. officials believe that North Korea now holds a stockpile of 60 nukes, more than previously estimated, while other independent experts believe the number is lower, but between 30-60. Additional reports state that the CIA and the other intelligence agencies of the U.S. agree with the DIA’s assessment. Over these infinitely tense environment, Pyongyang also issued a plan to fire an ICBM containing a war head into Guam, a U.S. island in the Pacific ocean and near the Sea of Philippines, of which trajectory will violate Japanese airspace. It is now clear that the ‘clock’ has reached an unprecedented moment, when North Korea not only has nuclear weapons but also holds that capacity necessary to deliver them against military targets, hence the rising deterrent factor that it applies. It’s unclear what kind of missiles is the DIA report referring too, but if it can fit on the following missiles: Hwasong-14 (KN-20) intercontinental ballistic missile (ICBM), Hwasong-12 (KN-17) intermediate-range ballistic missile, or Pukkuksong series (KN-11 or KN-15), then North Korea has indeed the operational readiness and technological know-how to strike South Korea, Japan and parts of the United States. The Hwasong-14 (KN-20) ICBM for example, has been tested twice this year in July, following a new wave of high tensions that are better described for that context in this past analysis, including the Chinese pivot, hypothetical regime change and the military option. In March 2017, Secretary of States Rex Tillerson announced the ‘end of strategic patience’, a North Korea policy followed by past Presidents attempting to cope with the North Korean issue, and instead adopted an ‘Enhance Pressure’ approach. The past strategy was founded on the belief that if enough pressure and isolation is applied, North Korea will eventually come to the negotiations table, in a way that worked, in theory for now, with Iran. The decades-long strategic patience instead resulted in a gradual increase of military capabilities, nuclear developments and missile tests that have paramounted in a functional cache of ICBMs and a significant stockpile of nukes. The perpetual bellicose attitude of Kim Jong-Un and his efforts driven to secure his throne also stirred anxiety at Beijing who were prospecting the idea of a regime change while not interrupting the dynasty, hence the assassination of Kim-Jong Nam by North Korean intelligence in Malaysia. The new enhanced pressure approach is currently unclear and blurred, being still in application and sheltered under the fog of public vs. backchannel diplomacy. For now, it seems that the unprecedented increase in hostile declarations against Pyongyang has not deterred it from trying to pursue nuclear weapons and ballistics missile technology. It did however, secure China’s public disapproval of the Kim Jong-Un regime, even though that could be circumstantial given their separate bilateral dynamic and how that evolved since Jong-Un took power. Strategic Patience has become obsolete and even an anachronism. The strategic environment has changed, shifting from a nuclear-aspiring North Korea to a nuclear armed and ICBM-ready one, capable of deterring its enemies. The U.S. is needed and willing to strike first in order to avoid letting itself vulnerable to the whims of a rogue nuclear state. And while diplomacy is still the first option, ‘Enhanced Pressure’ might be the last chapter in negotiations before bringing the military options upfront. This new dimension of American power projection towards the Korean Peninsula was needed, which as many other geopolitical disputes, are inter-winded with several other factors and inputs. Notably China, Russia or the Asia-Pacific order. ‘Enhanced pressure’ also implies, publicly made by Rex Tillerson, that all options are on the table, followed by President Trump’s ‘fire and furry’ comments and complemented by Secretary of Defense James Mattis declarations about the military options being prepared. The situations seems tense and critical, however, when speaking of the North Korea issue, hostile declarations or increased media coverage could easily fuel false and periodical alarmism which amounts to nothing. This is an occurring tendency for years, that could very well prove to be case now as well. However, given the new, earlier-argued context, there are reasons to believe this situation is different. while the U.S. increased its naval presence in the water around South Korea and Japan, while also equipping its regional allies with THAAD and Patriot (PAC-3) missile defense systems. THAAD guards Seoul from the border while reports suggest that the Japanese owned PAC-3’s have been detached in Hiroshima, Shimane and Kochi, shielding Tokyo from a feared course change. The two traditional U.S. allies are firmly against a preemptive campaign that has been rumored for the past months, since it would be impossible to stop all the small arms fire, rogue missile or rockets fired in Japan or South Korea. As James Mattis presented, such an options would imply a massive shelling of Seoul and the border area, that would cost thousands of allied lives. A war with North Korea is unwanted given the consequences and after effects it will produce, but it may become a reality, if theoretical, that is the next step after ‘Enhanced Pressure’ fails – if it does. Accordingly, a military campaign against North Korea’s nuclear program, which would be the best and more limited scenario, is more difficult than most think. Pyongyong’s key facilities are spread to all over the country and are protected by significant coastal early-warning systems (be they outdated and rudimentary) that could buy enough time for North Korea to do enough harm to its neighbors. Therefore, an escalating path to to war has several potential weaknesses for American strategy: allied disapproval. Notably, South Korea could be so desperate in avoiding a war that it could accept to rollback U.S. presence in the peninsula, appeasing their northern neighbors and their interests. While appeasement is a proven strategy for failure and would actually fuel expansionist prospects, it may be an mirage-option for Seoul. Therefor Washington needs to play this card very close to the chest, striking a balance between deterring North Korea and not alarming the South. L.E: Just one day after writing this assessment, President Moon Jae-In of South Korea issued a statement saying: ‘There will be no war repeated on the Korean Peninsula […] Military action against North Korea should be decided by ourselves and not by anyone else‘, further confirming our hypothesis that Seoul could block or temper US pressure on North Korea, if it considers that the situation reaches a critical boiling point. Open in ‘view image’ for a larger picture. Transylvania Intelligence recommends that the recent bellicose rhetoric between the U.S. and North Korea is actually a prelude to negotiations and not to war. If in March, Rex Tillerson stated that there will be no negotiations for the nuclear weapons, now he expressed openness for dialogue with Pyongyang if its halts missile tests. North Korea responded by saying that nukes are off the negotiations table, the United States needs to leave the Korean peninsula. Both actors publicly presented their interests: U.S. wants to de-nuclearize the peninsula, North Korea wants the American presence there gone or reduced to a sterile level. Convergence is very little if none at all, the situation is too black and white to find a middle ground. And that is exactly why they are now leveraging each other. General Kim Rak Gyom, chief of the Strategic Forces of North Korea presented on live television the fly path of Hwasong-2 rockets that sees the bogeys crossing through Japanese airspace and landing in the waters of Guam, a Pacific territory that hosts a strategic U.S. base. It is obvious that no country would publish its ‘going-to-war’ moment before it does, especially when only 50% of ICBM tests have been successful. This is actually Pyongyang’s way of deterring the United States, showing that it now has leverage through striking capability, informing their counterparts that the stakes have changed and that they are not the only ones holding a joker card. 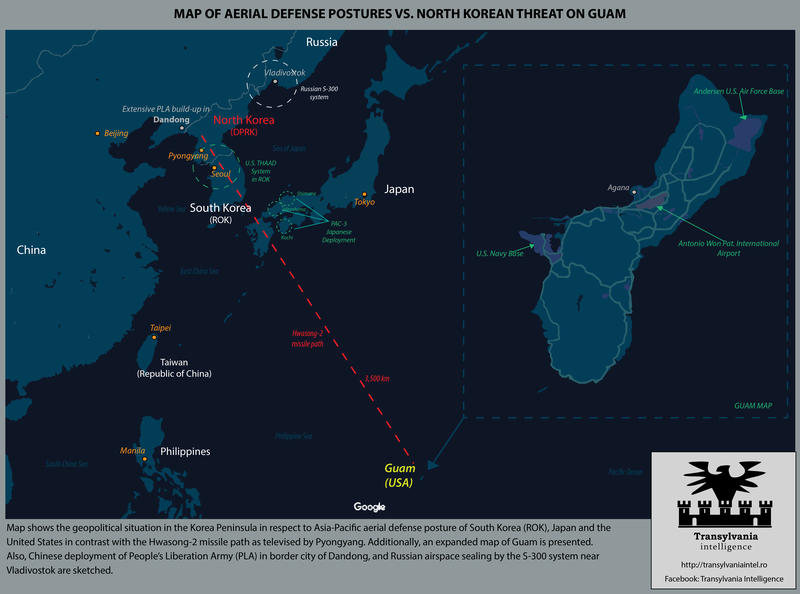 While the overall sentiment is that Pyongyong is bluffing with its Guam threat. L.E: The next day after writing this assessment, state news agency KNSA reported that Kim Jong-Un reviewed plans to fire a ICBM towards Guam but has now decided to post-pone the decision, awaiting Washington’s move. This also confirms our judgement that the Guam threat was a useful bluff for providing additional leverage in the negotiations. As of now, the United States does not have enough assets in the Korean Peninsula to fight an all out war with North Korea, it does have, however, strategic bombers in place capable of conducting preemptive sorties, recon and sabotage ops. While there are still enough ways to build-up forces in South Korea and Japan capable of going unnoticed by the press or observers, there would still be several weeks needed for a march towards a conventional conflict that would involve the overthrow of a government, securing nukes, dog fights, naval warfare (including aircraft escorts, counter-submarine ops), neutralizing enemy forces and occupying the country through massive numbers of U.S. Army assets and personnel. Anxious and nervous of the verbal war drums of the dispute, China and Russia have presented Tuesday a plan for de-escalating the tensions. They suggest that Pyongyang declare a moratorium on nuclear and missile tests while the United States and South Korea refrain from large-scale military exercises. This way, North Korea does not continue to enhance its nuclear and ICBM features while the United States would not conduct a build-up of forces in the South Korea under the disguise of military drills. There are enough reasons to doubt the reason and prospects of this proposal. For one, there is no guaranteeing body or force that could oversee a halt in North Korea’s nuclear program, nor is it feasible anymore, the nukes are produced, some ICBMs work, this is not an Iraqi or Iran situation where this late-stage can be prevented – what’s done it’s done. Chinese and Russian interests, although weakened and compromised by Kim Jung Un’s way of leading the country, still uplift the containment of Washington in Asia-Pacific as their utmost strategic aim. Even though many argue that a fragile management of nuclear North Korea should be the option of choice, being the lesser evil of the other scarier methods, Transylvania Intelligence considers that the volatile, unprecedented nature of an ICBM-ready and nuke-rich North Korea is too unpredictable and hostile to sleep safely at night for decision makers at Washington. While I do not consider that the Kim regime is irrational or ‘crazy’, there is a precedent and history of rogue states going out of their way in face of enhanced pressure and anxiety in order to secure their survival. However, America’s first options continues to be the diplomatic one, motioned by Rex Tillerson and Nikkey Halley that work around the clock behind the international stage’s curtain to negotiate a deal. A key would be bypassing Chinese mediation between the two and actually be able to establish a direct line of communication, something that Beijing might be opposed to, dully because that would cut China’s importance in the diplomatic dialogue and ignore it’s power-broker role in the region. And while diplomacy is in motion, Joint Chief of Staff General Joseph Dunford recently met with South Korean President in order to discuss military coordination and strategic issues in regards to this threat. It’s safe to assume, that contingency plans are planned and negotiated as never before, hence the after statement of ‘military action is our last resort’. If everything fails, then it’s better to attack now than later. Time is not on Washington’s side. Every missile test, every ICBM production or uranium enrichment means more nukes, better capabilities and an overall tougher North Korean defense posture. And while China continues to re-assert itself as being the bridge between Pyongyang and the intentional community, the bilateral interaction with the U.S. is complex and ambivalent, crafted by other inputs as their competitive nature in international affairs, Asia-Pacific geopolitics, and some rare episodic convergences. Regardless of perception, the North Korea regime acts from a rational motivation: ready-to-launch nukes secure the continuity of the regime and therefor, deter outside attacks. Washington may now be opened for clear negotiations but this position is fragile. An over aggressive misstep from Pyongyang, as enforcing their Guam threat, would put the Trump administration in a very though spot, prompting it to reinforce its red line. However, we should also bear in mind that preemptive action could actually be synonym to preventive war, there is not guarantee that targeted strikes on nuke sites would reduce a hypothetical conflict to just a limited campaign. This is not a time for missteps and anxious moves. 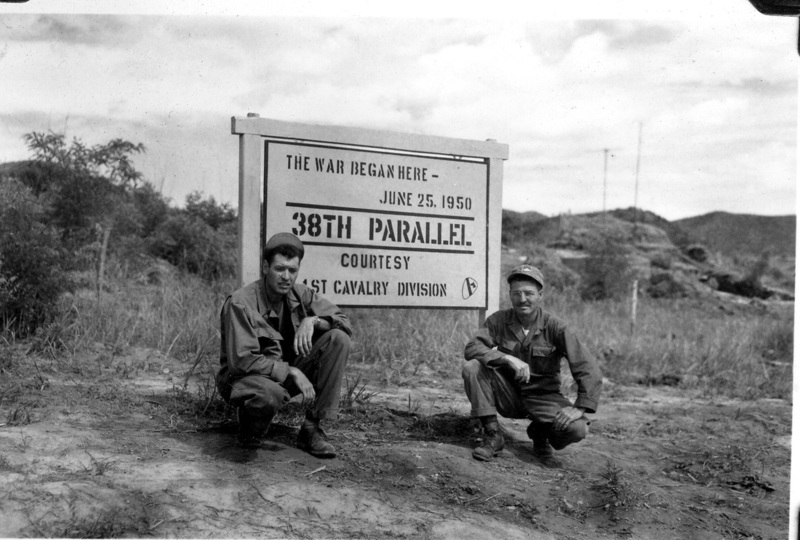 Another War in Korea would be the battle of a generation of Americans and a first when two nuclear powers engage in direct combat; the lack of historical precedent is enough to make anyone feel nervous, even if, pragmatically thinking, the option would be preferable now then later. The level of urgency has obviously spiked, and time should be judged as a resource for all strategic thinkers observing these events unfold.